The Italia is the latest incarnation of the mid-rear engined Ferrari berlinetta and will be unveiled at the Frankfurt Motor Show in September. While it's true that every Ferrari is innovative by definition, it's equally true that in the course of the Prancing Horse's history, certain cars have marked a genuine departure from the current range. This is very much the case with the Ferrari 458 Italia, which is a massive leap forward from the company's previous mid-rear engined sports cars. 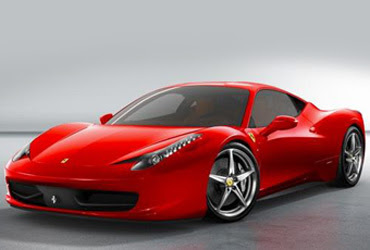 A two-seater berlinetta, the Ferrari 458 Italia, as is now traditional for all Ferrari's road-going cars, benefits hugely from the company's Formula 1 experience. This is particularly evident in the speed and precision with which the car responds to driver inputs and in the attention focused on reducing internal friction in the engine for lower fuel consumption than the F430, despite the fact that both overall displacement and power have increased. However, Ferrari's track experience makes its presence felt in the 458 Italia not only in terms of pure technological transfer but also on a more emotional level, because of the strong emphasis on creating an almost symbiotic relationship between driver and car. The 458 Italia features an innovative driving environment with a new kind of steering wheel and dashboard that is the direct result of racing practice. Once again input from Michael Schumacher—who was involved from the very start of the 458 Italia project—played an invaluable part.